According to family history, Norma Paulus was born in 1933 on the kitchen table in their Nebraska farmhouse, and brought to Oregon as a toddler when her family lost everything in the Dust Bowl. Although she didn’t go to college, she worked as a legal secretary in Salem, Oregon’s state capital, and then went to law school where she graduated with honors. Paulus had a wide-ranging career in state politics. When she was elected Secretary of State in 1976, she was the first women elected to statewide office in Oregon. As Secretary of State, she had to contend with the voting fraud crisis provoked by the Rajneeshee cult in the 1980s. Later, she was nationally lauded for her k-12 education reforms Superintendent of Public Instruction in the 1990s. Paulus showed boundless energy for new challenges, with both a vision for the big picture and a grasp of tiny details. Her new biography, The Only Woman in the Room: The Norma Paulus Story is a collaborative effort among Pat McCord Amacher, Gail Wells, and Norma Paulus herself, mostly in the form of hours of oral history she recorded in 2010. Amacher and Wells interviewed friends, colleagues, and family members, and had access to the Paulus papers archived at Willamette University and the Oregon Historical Society. These included everything from notes passed by legislators on the floor of the House, to personal correspondence, election profiles, photographs, and Rajneesh court documents. With sexual harassment and #metoo in the news so much these days, it is fascinating to read the story of a woman who launched her political career in 1969. Paulus said she never considered sexism an issue until she ran for office the first time and it smacked her square in the face. But what shows in her story is what a strong, unassailable sense of her own worth she always had. Paulus had a confidence in her ability to get things done on her own that seemed to keep her invulnerable to men in power. Norma Paulus's story shows a woman making a real difference in a man’s world without compromising her ideals, passions, or goals. This is a history that should appeal to feminists in any era. 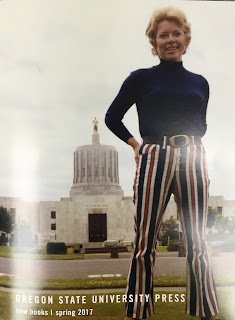 The Norma Paulus Story is part of OSU Press's Women and Politics in the Pacific Northwest series. So far, the series also includes books on Betty Roberts, Barbara Roberts, and Avel Louise Gordly.